Lately I've been thinking, "Something's gotta give." And today it did. It's been a while since I've painted in earnest. I've been frustrated and unable to get past the usual excuses that flood my mind: ("It's too late; I won't have time to get into it." "I'm not inspired; I don't know what to paint," "What if it's horrible and I waste a canvas?") It's like an itch you can't scratch. This evening as I lay on the living room rug, staring at the ceiling, too tired to make a move on my to-do list, to committed to send myself to bed, I got a sudden jolt of energy to spread paint on a canvas. Before the usual road blocks to creativity intervened, I picked my drowsy self up off the rug and went to work in my art space. What followed was a messy dash of paint smearing. 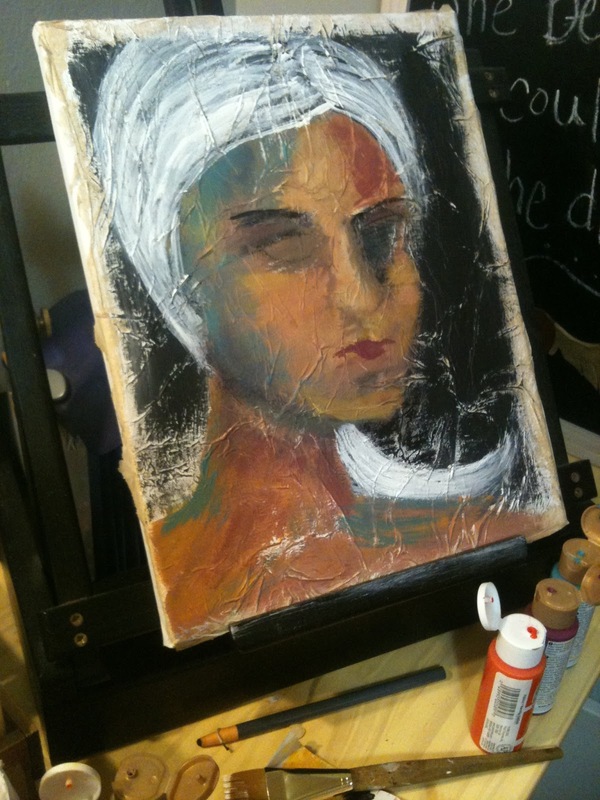 I put down several layers of paint before a form began to emerge- another girly face in abstract colors. All of a sudden my energy was back. The dam had broken and a flood of color and emotion rushed out. There was no stopping it once I put the brush to the canvas. I guess that's what had to give. I'm feeling better now. A painting born out of a need to release frustration...paint therapy at it's finest.